I have already attempted to justify my awful performance last week, so I’ll let it go. Just know this: The Top 10 went 4-6 against the spread and losers included LSU, Alabama and Florida State. I’m not the only one who missed a gimme putt (or five) last week. Since I’ve gotten the groveling off of my chest, I can now defame. Last week I was about as accurate a blind archer after a game of Lousiville Chugger. I was as dialed in as an unplugged cable modem. I was as prophetic as sandwich-board-wearing doomsday-soothsayer. And this week, I’m as confident as Alicia Keys in a Hong Kong karaoke bar. 0-5, you say? Poor performance? Well I say lowered expectations are easier to fulfill. The picks, as always, are in bold (Picks, sans spread, are bold in green). #8 Stanford (-7) at Washington (+7), 6:00 p.m. — Stanford is coming off a huge upset over USC and a bye week, while Washington is coming off a bounce-back win over Portland State and bye as well. Rest shouldn’t be an issue for either side, but if Washington wants to be a player in the Pac-12 North (or even just an eight-win team) they need this game — starting tonight, they embark on a three week stretch (#8 Stanford, at #2 Oregon, #13 USC) that is one of the toughest that any school will face all season. If Keith Price & Co. are going to take one of those three, I like them in this one. Stanford is coming off a big win over USC, and they’ve had a week to learn up them smart brains on the Washington game-plan. They also have Notre Dame looming in two weeks, a game that coach David Shaw has undoubtedly been working on. Any distractions and this Washington team, an under-perfoming bunch that might not be quite as good many experts hoped they would, could be their early undoing. I like Washington, who could prove why some experts had them ranked second in the Pac-12 North coming into the season. Who I’m taking: Washington (+7), AA. Arizona State (pk) at California (pk), 1:00 p.m. — Someone, somewhere has lost their minds. Then, as if inspired by the madness, people around them lost their minds. And finally, after the fervor of ill-advised gambling settled and the raspy-voiced degenerates surveyed their kingdoms from the feux-suade chairs in casinos around America, they surely let out a collective laugh. For one of two reasons. Scenario 1: They can’t believe the good-fortune which they have been blessed with. Cal, 1-3 against the spread this season was getting ZERO points at home against an ASU team that has gone 4-0 against the spread. It was a push. You can just take ASU to win the game, and as long as they win, you win. A wonderful situation. Scenario 2: The Gambling Gods know something that they don’t. If that is the case, this immediately becomes the most petrifying game of the week, nay, the season, and that laugh becomes a very nervous one. Why is there no love given to ASU, winner 37-7 last week? Why is Cal getting so much respect after failing to cover a 16-point spread against USC? Why did NBC steal Community away from Dan Harmon? If you gravitate toward Scenario 2, as I am, this game looks scarier than that new Jennifer Lawerence movie that ABC is shamelessly plugging. But stilllllll… I’m taking ASU. Cal’s burned me twice this year, without the benefit of points, so it’s hard to justify taking a 1-3 team in search of an identity. Even if they are playing at home. Who I’m taking: Arizona State (pk), AAA. UCLA (-20) at Colorado (+20), 6:00 p.m. — Last week, I said that trusting Colorado to cover a 20 point spread on the road was like trusting my pet hedgehog to vacuum the apartment while I was out. Well, I returned from Idaho this weekend and, alas, the floors were vacuumed, the trash was bagged by the door and Colorado covered a 20-point spread on the road. But Washington State has, for lack of a better term, sucked under Mike Leach. UCLA managed to still look serviceable during last week’s loss to Oregon State (a pass here, a catch there, an omission on that one, a call on that one, and things, you know, could’ve, would’ve, should’ve) and should still be considered among the Pac-12’s contenders, if not part of the elite. Oh, and they’re angry. Like “I’m gonna kick all the reporters out of Wednesday practice because I’m so angry” angry. Colorado should still be considered the conference caboose, and covering 20 points against the Buffs is about as taxing as eating a bag and a half of Fun-Sized Skittles (apparently too rough for Leach’s bunch). I’ll take the angered Bruins. Who I’m taking: UCLA (-20), AAA. #18 Oregon State (+2.5) at Arizona (-2.5), 7:00 p.m. — This is another one of those double-scenario games. Either early-week bets have swung the odds in a strange way, leaving an awesome play (like ASU, Oregon State is undefeated against the spread this season. Granted, it’s just 2-0, but picking against the Beavers has proved foolish this season. Just ask anyone who took a #13 Wisconsin team in week one), or the odds-makers don’t trust Oregon State and their two ranked victories. If that’s the case, this game is a just-as-scary nighttime sequel to the ASU-Cal game. It should be Oregon State. That is the pick. But a regression has to occur at some point, right? Isn’t what they’ve been saying about the Orioles all season? But I think this is the week to run with the Beavers. Arizona is reeling after their debacle at Autzen last Saturday, and RichRod has never been an All-Zen guy. The game is in Tuscon, but if he’s unwittingly stepped into the Michigan Quicksand (transported carefully to Tuscon by truck, of course) then he needs this game to avoid the mid-season free fall that became his Modus Operandi in Ann Arbor. He, more than any other coach in college football, can turn 3-0 into 3-5 with ruthless efficiency. Who I’m taking: Oregon State (+2.5), AA. #2 Oregon (-30.5) at Washington State (+30.5), 7:30 p.m. — I’ve learned something about you, Coach Kelly. You are a Jedi and you must be related to Yoda. You control the games using a unique combination of carefully articulated eye-squints, cryptic sound-bytes and strange hand motions. You fail to cover the spread for three straight weeks prior to conference play, and then proceed to swat away the 20-point spread like it was immobile mosquito. I get it. You’re sneaky. You’re coy. But you don’t mess with conference play. Well played, Coach. I see you. Oh right, the game. It’s at CenturyLink, the NFL’s Autzen, but expect the Seahawks stomping grounds to be decidedly green. No one likes to travel for a loser. Winning, on the other hand, is an excuse go anywhere. Blah, blah, blah, Oregon by 54. 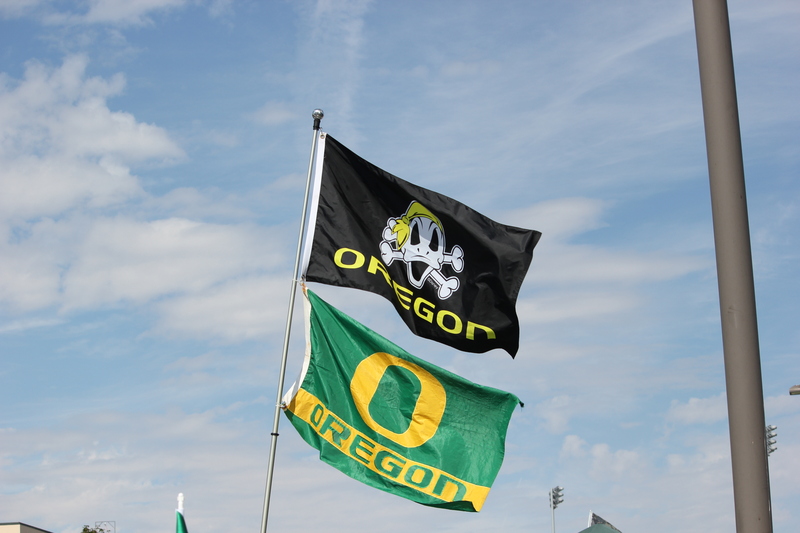 To continue this week’s Saturday tradition of taking home favorites… Who I’m taking: Oregon (-30.5), AAA.